Back in August aloe purple flush was my favourite plant of the week. (Post can be found here). I mentioned at the time that the only problem with the plant was that it doesn't produce many offsets. During the 6 or more years since purchase, it has only produced one. I have been avoiding splitting it, one of those times when you know it is going to be fine, but worry anyway. A couple of professional gardeners / friends came over on Saturday (Note to self, think about the state of the garden before spontaneously inviting people like this over). 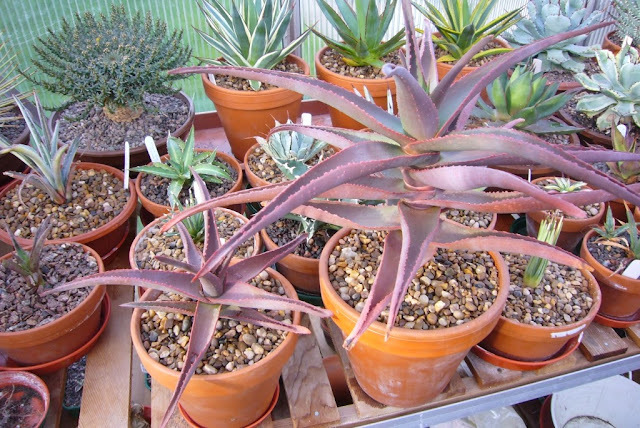 The succulent fan among them loved this plant as well and agreed that potting up may produce more offsets. Yesterday evening it was time to re-pot it and to see if it could be split. The pot turned out to pretty much pure root, so it took longer than expected to tease out the roots. Once that was done it was quite easy to pry them apart. As part of the new aim to keep into of the watering and feeding this one should do well. Sadly it will be mixed blessings as if looked after better it will loose that amazing colour. Now they have more space, hopefully there will be a few more offsets. When it blooms... do you think you would self it or cross it? My vote is to cross it. 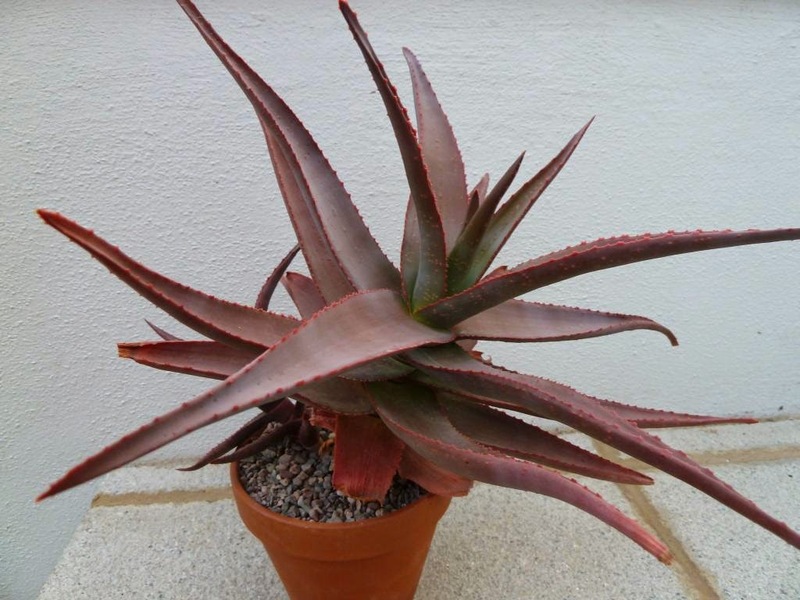 Maybe with Aloe cameronii for color. Or maybe with Aloe bulbillifera for bulbils. Or maybe with Aloe ramosissima for more branches... and because it would be great if there were more hybrids with ramosissima! I think I managed to cross my Aloe tenuior with a tree Aloe. There are four seedlings and they are still small but they are looking more stout than tenuior does. I'm really hoping that the seedlings will have stems that are at least twice as thick as tenuior's stems. If the seedlings are a hybrid rather than a selfing by the hummingbirds then it will be interesting to try and guess who the other parent is. I hedged my bets by using pollen from around 5 different tree Aloes. The seedlings look pretty similar so I suppose only one of the other Aloes was compatible. Have you had a chance to visit your Top-Of-Wish-List Aloe recently? 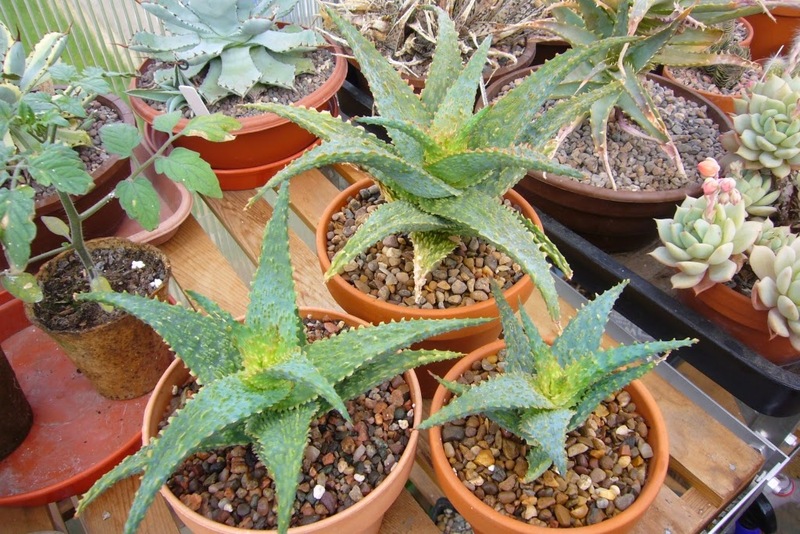 A few years ago I sowed around 4 pod's worth of seeds from my variegated Aloe arborescens. One of the seedlings was variegated. If I continue giving it plenty of room/food/water it should be blooming size next year. I'm guessing that cross pollinating two different variegated arborescens will result in a higher percentage of variegated seedlings. Eventually each and every one of my tree Aloes will be surrounded by variegated arborescens and resistance will be futile. This would be my same strategy if I had a variegated ferox. I'd surround it by variegated arborescens and see if ferox was persuaded to produce some variegated offspring. They wouldn't technically be a variegated ferox. They would be a variegated Aloe x principis. I'm guessing it wouldn't be too much lower on your wish list? Maybe you could run this strategy past the owner of the variegated ferox. Not sure if the variegated arborescens is readily available in your neck of the woods. If it isn't... let me know. I have a TON of offsets.